Don’t be misled by the title and think that this is a very heavy topic. I am just going to casually show you the different life stages of Havanese and kind of compare it to human’s life stages. It is going to be a simple and fast read. Let’s dive right in now. Since you have to take care of a Havanese puppy very well and closely, I will probably spend more time writing about their puppy stage than the other stages. Let me divid the puppy stage into different sub-life-stages to make things more clear. That’s the exciting time for those of you who can witness that magical moment. The is the time that the new born Havanese baby must stay with their mother to get warmth, food and, of course, love. 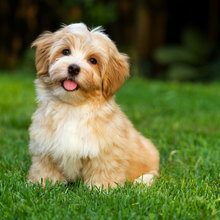 At this stage, the Havanese baby knows nothing yet and he or she only responses by instinct that he or she is born with. At this stage, the Havanese baby is still very weak. He still needs his mother. The difference between this stage and the previous stage is that the Havanese is beginning his learning now. This is the stage when you may want to start introduce some human interaction to his life. Although he should still stay with his mother most of the time, it is okay and believed to be beneficial to have some mild contact with human. That should help make him less afraid of human later. If you are the owner of the new Havanese puppy, this is the fun time for you. Week 8 is believed to be the best time for the Havanese to start having some more contact with owner. By contacting, I mean actually start a little bit of play around, not like the very mild contact that happens in the previous stage. It is also believed that this the best time to build a close relationship between the owner and the Havanese. This is the period that you should avoid introducing your Havanese with any scary experience. For example, ear cropping or shipping should not occur during this period or the fear that is induced can last for the rest of his life. Just beware of that and you should continue to do some mild training and continue to interact with your Havanese. At this stage, it is critical to introduce more human interaction to the Havanese. It is really nice if you, as the owner, already has the puppy at week 8. If not, week 11 to week 16 is the latest period to have more human interaction. I am not saying that you absolutely can’t let the Havanese stay with other dogs only at this stage. Instead, what I mean is that if the Havanese still don’t get that much human interactions at this point, he or she may never get along with any human being very well. That can be partially fixed by training though but avoiding the problem at the beginning is always better than reducing the problem at a later stage. If you compare a Havanese to a human, this is about the stage of human when they are between 2 years old and 3 years old. That means that this is the stage when your Havanese will behave immaturely yet cutely. It is the critical time to provide them with some training such as to potty train them. Just like human, it is very easy to learn something or develop habits when we are super young. To learn new things when we are over thirty, or even worse to un-learn a bad habit, it’s sometimes hard, sometimes painful. Havanese, like many other dogs, are different from human at this stage. If you compare dog age to human age, we are talking about the age between 4 years old and 18 years old for human. For a human, we would probably separate them into two stages, namely the big kid and teenager stage. For Havanese, we generally call it the adolescence stage. That’s the stage that you should expect the Havanese to learn everything the you want to teach him or you think that he should learn. Although a little hesitate to admit, our learning ability simply declines after we finish high school. We do make up for it with our experience and maturity though, just like what Havanese will do later in their life. When your Havanese reaches 3 years old, he is an adult Havanese. That can be happy and sad at the same time. The color of your Havanese’s coat should have already finished changing. He may not seem to be as cheerful and energetic as you would expect from an adult. Having said that, he is still is a very good shape mentally and physically and you will stilly enjoy having those long walks with your Havanese. When your Havanese reaches 7 years old, that’s like a human reaches the mid 40’s. That’s the time when ageing becomes obvious. More health issues may be discovered. When your Havanese reaches 10 years old, it is time to call him an old boy. Looking at it from a different view, you should be glad if you see this stage of your Havanese. Because that means that you have been with him the whole journey. And if you have taken care of your Havanese well and with a little bit of luck, your Havanese should still be able to enjoy the long walks with you, though he may be walking much slower than the little boy you once saw. Just be grateful for what you have and turn things into your precious memory when they are gone.